Didn't found it. Anyway, let's go back to the real topic! To prevent the pixelised pixelisated pixed pixies (ok, only pixies exist for my English dictionary.. xD), I started to make again the Heroes II Font. So, first, I make it pixelised, kind of just copying the BMP files of the game, as "I don't know who" did it before. After I finish it, I plan to make it not pixelised. I need to check all little letters, and fix some caps letters too. + adding a maximum of others languages style, to make this font being able to be used in any European language. I plan to stamp it as "Lands of Enroth", not really as GodRage one. By the way, there is some empty utf8 characters, where (if many people helps out) we can write the name of each hero whom worked on it. Why can't we just use 2 filters like me? But it's certainly the best way for images actually. I see what you mean, and I agree it's a smart way to do it. I will keep it in mind, but right now I will try with Font struct's website. I think it is very, very good effect for couple of minues of work (note that any artifacts like rounding or partial invisibility of # for example are here because of wrong filter settings and resolution and probably can be avoided). Yeah, for couple minutes it's a great result. Your x10 (but it's x2, right? ^^)... all the letter lost they courbes. And I think that whatever the filter/programs it won't make soft lines as accurate as my aim. But the x1 one is really great! Good job, I will be waiting for this I was looking for such font some time ago, but I couldn't find it anywhere. the font is originally in 11px. Thank you for this beautiful Heroes of Might and Magic II ! 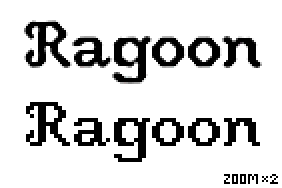 For me, this sould become the "Homm2 Ragoon Font". 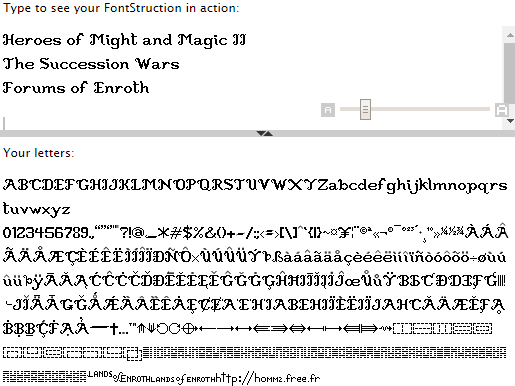 Yeah, it can be used to make an other Homm2 Font. I finished my pixed Heroes2 Font. Almost all latin characters are inside. No extra languages. But still, there is some letters that I saw for the first time and so didn't made them; I prefer that if you use it and see a missing letter, you tell me what letter is missing, hen I will do it. Thaks! Beauty! But erathian font is not redable. Only decoration. How about font from title Heroes I and II? Do you know any free program to convert bmp to ttf? How to do it? Actually I did all the little letters (without accents), and a part of BIG ones. Yes its very hard. ttf are very complicated. You must write it using mathematical calculations! Simplest way would be cnoversion from bmp. But I dont know how to do it. I finished the first version of the font. So only CAPS LOCKS and small letters are done. I'm sorry to tell you that it's not perfectly made. Good work. I like it! 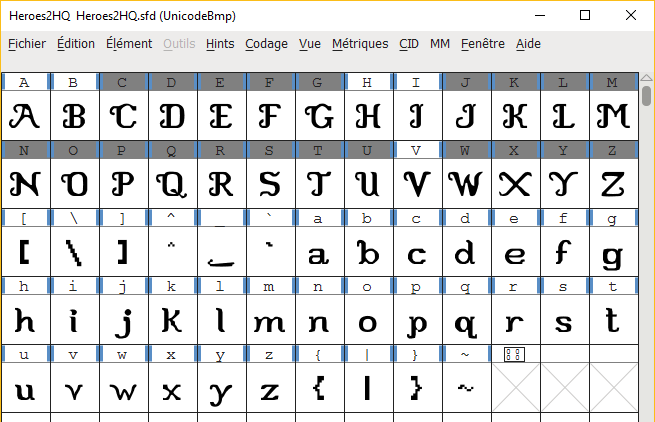 I didn't work more on it, but soon or sooner I will update it; there is numbers and letters with accents (éàû etc..) that are still in 11px style. Yes I like it and work on font too. Its Cheroes Chronicles title font and Might and Magic VII-VIII font. Will be good title Heroes I, II font but i dont see tool to convert from bmp. Manually its hard work. But manually not pfoffessional correctly is fastest method.